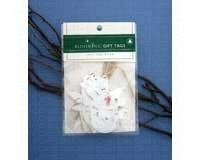 Cast Paper Art - Gift Tags 5 Asst Shapes (1 pk - 5 shapes) These Blooming Gift Tags come in sets of five and include To and From tags with planting instructions and natural raffia ties. They are attractively packaged and easy to display. Each blooming adornment is crafted of 100% recycled cotton fiber, fresh flowers and wildflower seeds. Tie on a package, then plant in 1/4 inch to 1/2 inch soil, keep moist and watch it bloom. If you have any questions about this product by Cast Paper Art, contact us by completing and submitting the form below. If you are looking for a specif part number, please include it with your message.